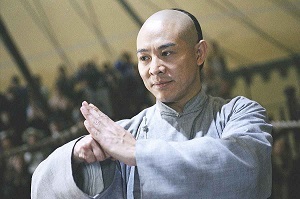 Jet Li’s last wushu film is entertaining, with some great fights, but is time and again bogged down by clunky emotional passages. Whilst director Ronny Yu explained before the film the difference between traditional Chinese reality-bound action films like Fearless and the fantastical ones like Crouching Tiger, Hidden Dragon (Wo hu cang long) or House of Flying Daggers (Shi mian mai fu), Fearless has its fair share of extreme wirework. Based on the true story of Huo Yuanjia, the founder of the Jin Wu Sports Federation, the heart of the tale concerns the Chinese people and their attempts to stand strong in the face of Western imperialism. Huo Yuanjia’s tale of redemption and sacrifice has all the makings of a classic epic, though the film has a tendency to get rather heavy handed. It’s about as subtle as one of Li’s kicks to the chest. If Fearless had been an out and out action movie then it would have been fantastic, but unfortunately it falls into clichéd and predictable moments that fail to provoke any sympathy, except in maybe the final act. It’s a pity that Li had to work with such a script (which surely isn’t simply a result of poor translation), cos he really got to show off his previously unexplored acting abilities in Unleashed (Danny the Dog). The extensive showdown scenes are kept lively by the fact that (in true cinematic style) everyone uses different weapons and has different techniques. From the Spanish fighter to the gargantuan Hercules O’Brien (Nathan Jones) and honourable Anno Tanaka (Shido Nakamura) – the tiered levels of competition end up resembling something like Bloodsport or even The Game of Death. The action scenes are certainly the strong point of the film and in fact manage to convey more passion, emotion and intelligence than any of the dialogue. Admittedly I don’t have a great track record with the recent Chinese action films that have made it overseas – Crouching Tiger only vaguely interested me, and House of Flying Daggers was admittedly very pretty but really rather dull. If those two were your kind of thing then maybe Fearless is for you. This entry was posted in Film Reviews and tagged Foreign Language, Martial Arts, Period Drama by Stuart Wilson. Bookmark the permalink.